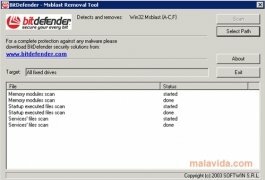 The 11th of August 2003 was the day that MsBlast started to spread, one of the most damaging and problematic viruses of that period. 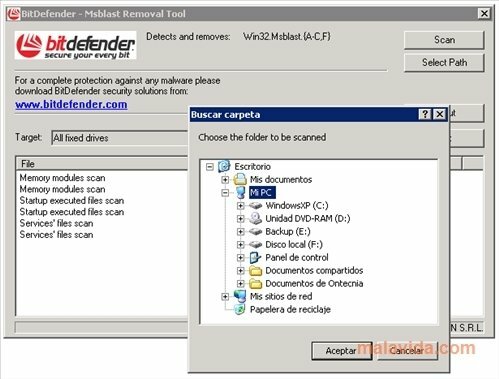 That year, thousands of computers using the Windows 2000 and XP operating systems were infected. This virus took full advantage of the vulnerabilities in the RPC (Remote Procedure Call) allowing the arbitrary launch of code. With Msblast Removal Tool, a tool created for BitDefender, we can get rid of this malicious virus. Its spreading method was based on coming in through the TCP/135 port taking full advantage of those computers that didn't have the corresponding security patch installed that solved the vulnerability in the RPC, after which it started the small FTP service included in Windows. Once completely installed and granting itself all the permissions that it needs, MsBlast is capable of launching DDoS attacks towards any server, managing to topple it in a matter of minutes. This is why the disinfection by means of Msblast Removal Tool is so important.